Сочинение одной из наших учениц и помощниц Даши на тему ее любви к лошадке Привилегии. Hi! My name is Dasha, I want to tell you about the horse’s love. One day I was at the bottom of the birth of one of the company which was engaged in breeding of horses. When I went to the stables in my eyes, I immediately rushed filly a brown suit , and her name was a Privilege. 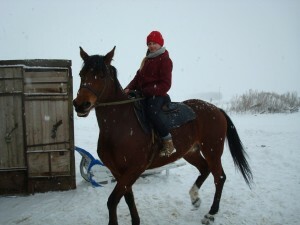 After that I firmly decided to do horse-riding. I always knew that one day I am allowed to sit on this beautiful, with unforgettable eyes and muzzle of a horse. And that’s when I already have successfully finished training, was finally the day, when I sat on the Privilege. At first I was a little scared, because she could me off, but she did not have a slightest attempt to do this, between us immediately appeared contact. The Privilege was such a smooth gait and lynx, that it seemed as if we’re going. The wind has developed its bright black mane and my hair is Golden, we mingled with her together, fled with her on the spacious meadows, she was like a flash of lightning, and everywhere in the district heard the clatter of hoofs, as if thunder. Since the day when we’re together by bonds of horse love, I always ezdiyu on it and almost no one except of the best friends I don’t want you to sit on my beauty, because I was tormented by jealousy like it when I touch or ezdiyu on another horse. I am now working on the yard, teach children riding, clean feeding and taking care of all the horses. Now we with the Privilege of late, horse love is forever, and it will not break!